A translucent entrance for the Van Gogh Museum in Amsterdam has successfully knitted together two iconic but very different 20th-century structures. It creates a seamless and welcoming experience for the visitor, thanks in large part to its Dutch architect Hans van Heeswijk's mastery of intuitive spatial logic and state-of-the-art glass technology. Before the latest €20m architectural intervention it seemed that this leading global attraction's two landmark buildings -- one by Dutch architect Gerrit Rietveld and the other by Japan's Kisho Kurokawa - had long ceased to meet the demands of the museum's global audience. 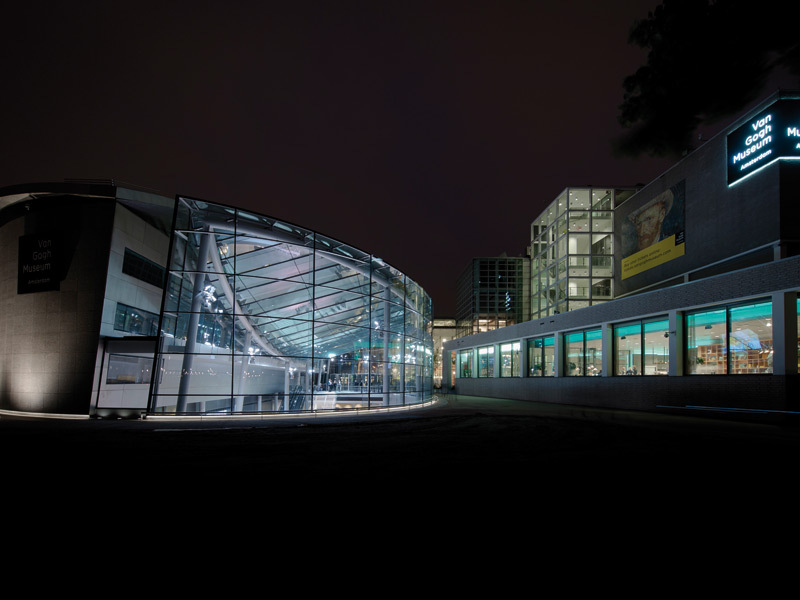 For the past three decades the Van Gogh Museum has been a victim of its own success. Rietveld's functionalist masterpiece, finished in 1973, was only designed to accommodate 400,000 visitors a year, but by 1990 visitor numbers had swollen to more than one million (now 1.6m). When an enterprising Japanese insurance firm offered to fund a new temporary exhibition wing, on the proviso that its architect was Japanese, Kisho Kurokawa was hired. His elliptical building, completed in 1999, doubled the space and formed a pleasing, asymmetric counterpoint to Rietveld's rectilinear block. But it didn't alleviate the vast queues of people waiting along the pavement by the former entrance, on the road-facing side of the Rietveld structure. Access to the new wing also proved counterintuitive: down a staircase and along a ground floor tunnel that many visitors apparently failed to locate. In addition, a shallow pool that completed the building's elliptical outline soon dried up, offering only dirty tiles instead of the shimmer of water in which Kurokawa had envisaged his building's titanium facade reflected. The programme of temporary exhibitions had more or less ground to a halt when director Axel Rüger (see Curated Diary following this) decided something had to be done. In 2012, he visited the Kurokawa Studio - now without their deceased figurehead - and asked for these problems to be solved with a new entrance in place of the pool. The pond is now gone, and visitors now access the museum via doors in the glass facade, descending a sweeping glass staircase into a vast, 800 sq m hall. All the museum's facilities are instantly apparent, in an inspired gesture of visual and operational connectivity: the permanent collection to the left, a cloakroom beside it, the temporary wing to the right, the shop flowing on from the foot of the stairs (with toilet block behind it) and, clearly visible through the glazing, the Rietveld building's ground-floor restaurant. The subtlety of the structure means that it impacts minimally on the two adjacent buildings and the visitor. Though the way it achieves this invisibility is impressive, all courtesy of China's state-of-the-art, glass-manufacturing technology. The facade is made from cold-bent, double-laminated, insulated-glass panels, shaped on site during installation. The facade comprises 20 glass fins, all of which are unique, with the longest at 9.4m. The roof's shell-like geometry is created by 30 glass roof fins, again unique in length, which had to be constructed in China to the nearest millimetre (working from a one-to-one model devised beforehand, on site). Each roof panel took four months to make - so if any one of them had been out by a few millimetres, the build programme would have been delayed by another four months. It was van Heeswijk's decision to make the entrance almost entirely of glass; Kurokawa Studio's 2012 sketch combined glass with steel in a style more typical of his Eighties' designs, says van Heeswijk: 'My belief is that if Mr Kurokawa had been alive today, he would have designed a state-of-the-art structure of 2015.' Glass was an obvious choice, not only for its subtlety and transparency but also as 'the most innovative developments are in glass'. Even the glass staircase is supported by a triple-laminated glass arch, with steel pins merely holding the pillars and stair pieces in place, along with wiring for the LED lighting. At night the stairs become a sculptural light element as well as a glamorous canopy for the hospitality area underneath.